Another fantastic day here at Lewa! After a visit by the monkeys and a delicious breakfast of sausage, eggs, fresh local fruit and homemade bread prepared by the lovely staff at Ngiri house, we head for the clinic. A giraffe on the way to the clinic! Dr. Michael and Dr. James working on their presentations after breakfast. We can’t complain about the commute in. In fact, it may be the only example of a drive to work that you hope doesn’t end! Between the impala, giraffe, zebras, and other animals, it is simply beautiful. It exudes a peaceful tranquillity that I don’t experience anywhere else. After seven trips here, I can honestly say the beauty never gets lost on me. An open and interactive discussion on diabetes and hypertension. The staff have an opportunity to talk about specific complex cases that they've encountered and are able to obtain valuable insight by the doctors. Dr. James giving a talk on the management of hyperglycemic emergencies. I think it’s important to point out that these topics were requested directly from the clinic. As much as our goal is to implement our chronic disease program, we want the clinic to know that we are their partner and want to address the issues that they are contending with on a daily basis. It’s a bit of a balance, but we believe that the best approach is one where we build trust with them, assuring them that we are here to help them on the topics that are affecting them most and not simply imposing our own program oblivious to their areas of urgent need. Vanessa and Jen working on a presentation together. The second half of the day is reserved for seeing patients. Dr. Michael to see the children, Dr. James to see the adults and Dr. Sidiqa continued the training with Lydia on the auto refractor. Vanessa brought out her stickers for the younger patients and kids gathered at the clinic. One of the issues we’ve encountered is within the vision program. After the last trip we decided to fund an ophthalmologist to come to the clinic on a monthly basis in order to continue the training with Lydia on the vision equipment and eye care. Unfortunately, as it goes when trying to implement things remotely, it didn’t go exactly to plan. Basically, the ophthalmologist was providing a weekly vision clinic without providing any training to Lydia. Although it’s good that the community was receiving eye examinations once a month, Naweza’s goal is to build capacity at the clinic so that they can conduct the eye clinic themselves. 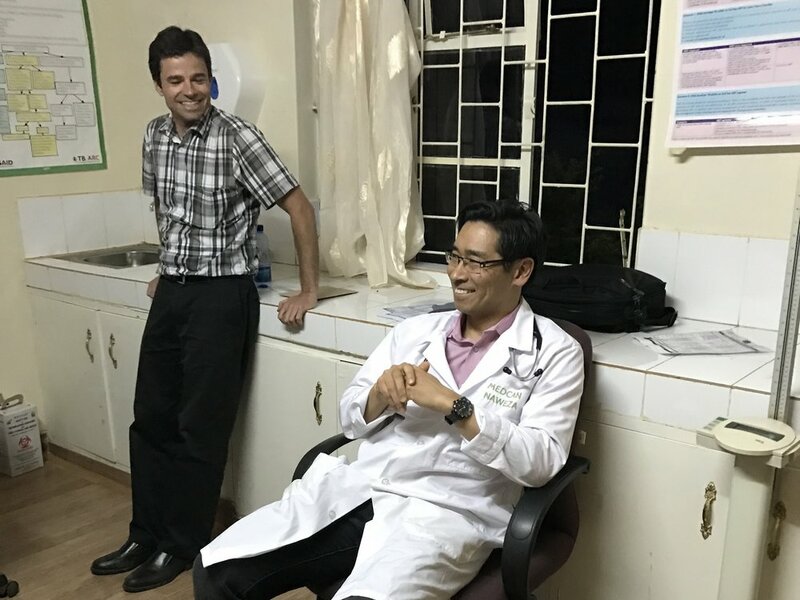 Dr. Sidiqa and I had a meeting with Ezekiel, the clinic manager, Stephen, the county ophthalmologist, and Lydia, the clinical officer, on our thoughts on how to move forward. I told them that this wasn’t about outsourcing the eye program. Naweza’s goal is to provide education and training to the clinic so that they can operate at a higher level without external help. Overall it was a positive meeting. I believe our expectations were well understood and appreciated and I’m hopeful we’ll now continue on the right track. We shall see…. Dr. Sidiqa and Lydia (wearing an "eye chart" t-shirt we gave to her). Dr. Sidiqa and Lydia had a solid day of training in the vision clinic. Lydia was able to practice on the auto refractor and trial lens kit as well as receive lots of education on eye health. They were also able to distribute prescription glasses that Naweza sponsored for 12 people. It is especially meaningful when the children receive the glasses, giving them a better chance at doing well in school. We’ve seen too many examples where the kids perform poorly in the classroom not because they are not capable students but because they simply can’t see the chalkboard. This will hopefully improve their confidence and make a lasting impact on their future. Dr. Sidiqa with a young patient. Dr. James’ last patient was a 42 year old man who presented with his left eye swollen shut and dramatic weight loss. He was found lying down on the side of the street and two “Good Samaritans” picked him up and brought him in as they knew that “mzungu” (white people) doctors were at the clinic and perhaps they could help him. After examination by Dr. James and Dr. Michael it was concluded that he likely had complications from HIV. He would require further testing to confirm the diagnosis. A very sad case to end on, and unfortunately it is not uncommon to see cases this severe. Dr. James and Dr. Michael at the end of a long day. My bedroom at Lewa. I've stayed in this room every time (except once when we stayed in tents). After 7 trips, it truly feels like my home away from home. Sharing photos around the fire after dinner. Tomorrow will be a day of outreach at a village not too far from the clinic. Ezekiel has organized for extra staff to come in so that his main staff are all able to go to the outreach to continue their training and education. However, the main emphasis is not on training; the purpose of the outreach is to see as many patients as possible, build trust in the community and to stay in touch with their most prevalent health issues. The weather report is calling for rain, which always adds a layer of challenge. But we just take it as it comes here. All I can assure you is that it will be an adventure. Newer PostDay 4: Come rain or shine, it's outreach day!